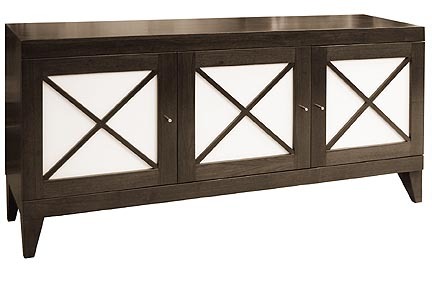 60"w x 16"d x 32"h.
Custom sizes, door inset material and finishes are available. All media consoles, credenzas, dressers, and desks designed by Jan Rosol are unique pieces custom made by master craftsmen. Selected materials and the finest finishes are the essential parts of the final product. Our finish options include matte, satin, and our state of the art hand polished high gloss finish. Each piece of Jan Rosol furniture is an original, one of a kind object.